Black wins with , a, or b. If Black a or b, White has a ko threat at c. With , White has a ko threat at b but c is not sente for White. Thus, Black may exchange c for d anytime (= 1 point sente). So, I conclude is best. 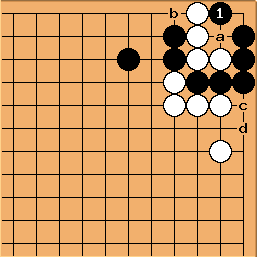 togo: And even better: If I see this correctly, White's ko threat at b only kills, if there is a white stone to run to (Although unanswered it weakens Black's stones considerably. ).